The Mind at Hand explores how artists, scientists, writers, and others - students and professionals alike - see their world, record it, revise it and come to know it. It is about the rough-drawn sketch, diagram, chart, or other graphic representation, and the focus these provide for creative work that follows from them. Such work could involve solving a problem, composing a musical score, proposing a hypothesis, creating a painting, and many other imaginative and inventive tasks. The book is for visual learners of all kinds, for scientists as well as artists, and for anyone who keeps a journal, notebook, or lab book in order to think and create visually. It is also a book for teachers and educational administrators interested in learning about new active learning strategies involving drawing, and possible outcomes of these in classrooms. It is a book about how learning occurs, not only across disciplines, but in all kinds of creative endeavors, through a continuing process of creation, revision, and re-creation. It is drawing-to-learn. "As even a casual reader of The Mind at Hand will quickly discover, Michael Strauss possesses that rare combination of variegated talents that make him a contemporary version of the Renaissance Man. Strauss ranges deftly between both hemispheres of the brain—from the analytical to the imaginative, from the sciences to the arts—with an appreciation for each that is infectious. He is equally at home exploring theories of cognition and discovery as he is explaining the process of creation and re-creation in a century-old painting." "You may think of drawing as a form of creating or re-creating, but Michael Strauss shows how drawing can be a powerful form of learning. Through a host of compelling examples—from his own life, from classrooms at all age levels and in many disciplines, and from the work of famous artists and scientists—this book demonstrates how drawing and revising drawings can benefit teachers and learners, inventors and researchers—virtually all of us. It’s a fascinating read!" "Michael Strauss argues that scientific and artistic endeavors are integral to each other. In The Mind at Hand he provides many examples and sources, blending genres by immersing himself in both science and drawing, personally demonstrating the social construction of disciplines. In this new book he helps yet more of us expand our horizons through first-person vignettes, stories and testimonies that embark into qualitative inquiry, an elaboration of the work of people who use drawing as an integral part of thinking and learning." "The Mind at Hand offers a uniquely functional perspective on that most basic aspect of the visual creative process, drawing. Much in the spirit of Focillon's The Life of Forms in Art, but offering examples from all aspects of life, Michael Strauss explores the territory of creative revision – the development of an initial idea through to its conclusion – with an infectious enthusiasm for the creative process as a powerful tool that we all can share." "During the past two decades both Michael Strauss and I have promoted the concept of 'writing to learn' at all grade levels, and in all disciplines across the curriculum. As a practicing academic scientist, Strauss has successfully persuaded both teachers and students in a variety of disciplines, that informal writing-to-oneself in symbolic and graphic ways, as well as in English, is a powerful way to learn virtually any subject matter. With a lifelong interest in drawing and painting, Strauss has stretched the concept of 'language for learning' to include 'drawing to learn,' practicing it himself, offering university seminars to interested students, and publishing books and essays explaining and illustrating the idea to lay audiences. His strength as a professor and an artist is an ability to make difficult concepts clear to those of us who are neither scientists nor artists. 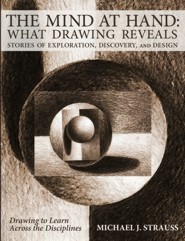 He does this through exposition, careful illustration, and the use of exemplars of drawing to learn, many of which are described in The Mind at Hand: Stories of Exploration, Discovery and Design." Michael Strauss was a professor of chemistry at the University of Vermont (UVM) from 1968 to 2003. His academic life focused on teaching chemistry and on research in physical-organic and medicinal chemistry. Since 2003 he has been teaching drawing for the Honors College, the College of Arts and Sciences, and Continuing Education at UVM. He has also been involved with outreach efforts in grade schools and high schools around Vermont, focused on science education. In all of his classes, both art and science, the iterative process of learning how to see, draw, and revise was paramount. There was considerable overlap between his university teaching and his outreach efforts in community schools. He had, along with colleagues in the College of Education at UVM, a National Science Foundation grant from the Teacher Enhancement Program to help train teachers in both active learning pedagogy, and content in chemistry, physics and geology. And for about a decade, he was also heavily involved with the Writing-to-Learn and Writing Across the Curriculum (WAC) movements, traveling around the country giving workshops and meeting with educators in both elementary schools and colleges to talk about science education. Strauss realized that part of the pedagogy of Writing-to-Learn elaborated in those workshops was happening in both his elementary school science workshops, and university science classes. The realization was simple enough. The term "writing," when considered "writ large," could encompass any kind of mark making: mathematical and chemical symbols, musical notation - drawings of any kind. The learning part of Writing-to-Learn was happening as part of a very important feedback loop of creation, observation, and revision. This process can be done with texts in order to learn how to write better, but also with marks, images, and symbols of any kind, to learn their meaning and relationships better, and to solve problems.